MYTH #40: 1934 was the hottest year on record in the U.S.
How can we be getting warmer when the hottest year on record in America was eight decades ago? 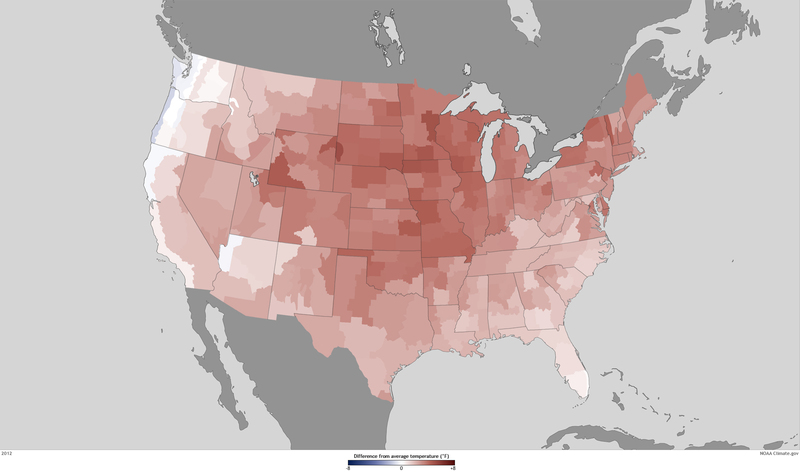 2012 was by far the hottest year on record in America’s Lower 48. In the contiguous United States, the record wasn’t even close. 2012 was the warmest year on record, and 1 degree Fahrenheit warmer than the previous record in 1998. 1934 comes in fourth. But here's what matters the most: One year only gives us a snapshot in time, not a long-term trend. There’s also no reason to expect the temperature trends in the U.S. — which only makes up 2% of the planet’s surface — to perfectly track the average temperature of the planet. Globally, 2010 was tied with 2005 for the hottest year on record, and 1934 didn’t even make the top 60. Nine of the ten hottest years on record have occurred since the year 2000.